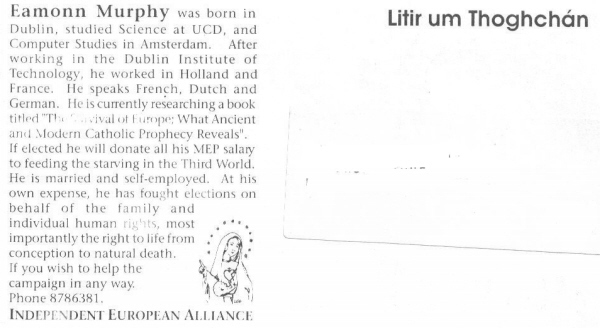 Eamonn Murphy from the 1994 European elections. It has one of the strangest reasons to vote for a person I’ve seen. Based on an apparition of the Blessed Virgin to a Japanese Stigmatist in 1973, accepted by the now Pope Benedict XVI (Cardinal Ratzinger) , Murphy wants to prepare for the prophesies and other forthcoming disasters by maximizing food production. “Independent European Alliance’ in 1994. Amongst those he outpolled in 1994 were PD candidate Stephen O’Byrnes, Fianna Fails Olive Braiden and Sinn Feins Larry O’Toole.